Award-winning author Jenifer LeClair delivers a taut thriller set against the rugged Maine Coast and the Bay of Fundy, a landscape both beautiful and unforgiving. 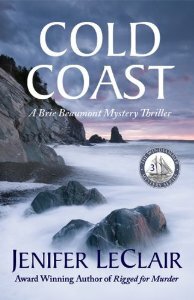 Detective Brie Beaumont teams with the Maine State Police to investigate a grisly murder 'away' Down East near the village of Tucker Harbor, Maine. A second death, a four-year-old mystery involving a research scientist, and a mysterious unexplained phenomenon draw Brie into an ever-tightening web of intrigue and danger. Themes of isolation and the destructive power of secrets play hauntingly throughout this gripping thriller, the third in Jenifer LeClair's acclaimed Windjammer Mystery Series.